St. Steven Serbian Orthodox Cathedral in Alhambra, California was the setting on September 5-6, 2015 for the canonization of Father Sebastian Dabovich as the newest Orthodox saint of America. His Holiness, Patriarch Irinej of Serbia led the liturgical celebration with the participation of His Eminence, Archbishop Demetrios of the Greek Orthodox Archdiocese and hundreds of bishops, priests, and faithful from around the world. St. Sebastian was honored as the “Serbian Orthodox Apostle to America” for his imitation of the Apostles in his missionary labors among Serbian and other immigrants across the United States. Born in San Francisco with the name Jovan (John) during the time of the Civil War, his parents were immigrants from Serbia who operated a store and later a wholesale fruit business. At the time of his birth there was no Orthodox Church in San Francisco so the infant Jovan was baptized in the chapel of a Russian Imperial Navy ship which was anchored in San Francisco Bay. It was only in 1868 that a priest was assigned to organize a parish for the Orthodox Christians and in 1872 Bishop John (Mitropolsky) of Alaska moved his headquarters from Alaska to San Francisco. With an active parish life now established in the city, young Jovan became dedicated to the church and attended every service. It was his desire from a very young age to serve God as a priest and never wavered from his intention. He attended the Mission School which Bishop John had established and became proficient in Russian, Church Slavonic and Greek. Following his high school graduation, Jovan served the San Francisco parish as a reader and chanter and in 1884 moved to Sitka, Alaska to continue these responsibilities. While in Alaska he organized a mission to share the Orthodox Gospel of Christ with the native Tlingit tribe in the area that is now the state capital – Juneau. During his stay in Alaska, Jovan decided to enter the seminary in preparation for the priesthood and from 1885 till 1888 he was enrolled in the St. Petersburg and Kiev Theological Academies. He was tonsured a monk with the name “Sebastian” while in Russia and ordained a deacon. He returned to San Francisco in 1889 and was ordained a priest in 1892. Without any outside funding or organizational support, he carried the gospel of peace from country to country....Concentrating much of his work in the United States, he ceaselessly traveled back and forth across the American continent, using every available mode of transportation – from stagecoach to railroad to foot. His wider ministry stretched from the Aleutian Peninsula of Alaska, to Russia and Japan, to small Balkan towns on the costs of the Black and Adriatic Seas. Despite his heavy schedule of missionary journeys, he found the time to produce one of the first English translations of the Divine Liturgy. He also published English language books on the Orthodox Faith, the divine services, Lives of the Saints, sermons and the first English translation of the Life of St. Innocent of Alaska. Interestingly, he accompanied his Bishop Nicholas to the White House in 1897 when he served as a translator with President William McKinley. The bishop asked for a meeting with the President to express his concerns over the confiscation of church property in Alaska and the treatment of the native Orthodox Christians of Alaska who were being forced to work on Sundays and feastdays. 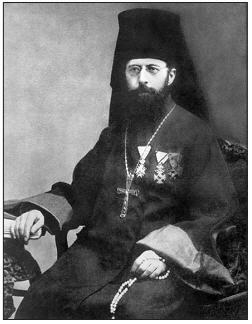 Archimandrite Dabovich could have been a bishop even in 1907. The Russian archbishop wanted to consecrate him as Russian bishop for the Serbian people. But the Serbs did not want it that way. Archbishop Tikhon was sorry about that. He was eager to show his appreciation to Fr. Dabovich for all his wonderful work. Failing to make him a bishop, he did something else. Once when he celebrated the Holy Liturgy in the Serbian Church in Chicago, he presented our archimandrite with a precious mitre, which was worthy 1,000 rubles in gold. But Fr. Dabovich quickly sold that precious gift and gave it to the church towards paying its debts. Such a man was he. He was absolutely unselfish. His poverty amazed me when I met him...I invited him to lunch. Blushing, he said, “Thank you; I just bought a roll of bread with my last five cents.” And salary? None. He lived on people’s freely given donations. And still, even with empty pockets, he planned new journeys to Alaska, to Japan, and of course, to Europe. My body is getting weaker and weaker. I would like to see once more the Golden Gate. All my dearest memories from childhood are concentrated in San Francisco and in the country in which I was born. As he approached the end, he was asked “Do you have any wish, Father? His final words were: “Only the Kingdom of Heaven”. He died peacefully on November 30, 1940 and was buried in the monastery’s cemetery. His holy relics were transferred back to America and are enshrined in the parish he established in Jackson, California.